Place all ingredients in the blender and mix till smooth. Serve immediately. Makes one big serving that will keep you full for a while. 111 members have added this recipe to their cookbook. Ona the new WW plan fruit is free ... so why not just use frozen fruit and a good protein powder. I get only 4 points by using Almond Milk - Frozen, no sugar added fruit, plus a 1/2 c yogurt. Even by adding Chia it still stays very low on points. Just a suggestion. Good luck - God bless you ! I DO NOT LIKE ANY OF THE SUGAR SUB. ... I know you can't taste it but I CAN. Smoothie recipe is only 3 WW pts. 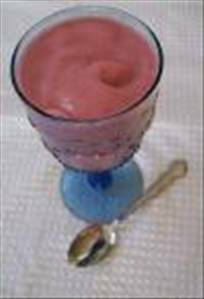 There are 216 calories in 1 serving of Strawberry Soy Smoothie. Calorie break-down: 21% fat, 59% carbs, 20% protein.